I love that I designed it, complete with light up front wheels, a bright red frame and a tiny little bell. I love that the cushion is the most comfy and supportive ever, to the extent that I stay in it, even when I have the choice. I love that as I speed down corridors at work, the porters have taken to yelling ‘DOCTOR ON CALL!’ Or ‘GO DOC, GO!’ At me. I love that it has allowed me to get back into exercise, racing 10ks and training for Triathlons. I love that I take fewer painkillers as a result of using my chair at work – and I love that my chances of getting an ulcer is massively reduced because of this! 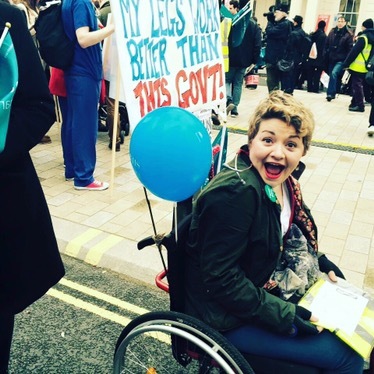 I love that people are constantly surprised by what I can manage in my chair – whether that’s going upstairs unaided in the Council Chamber of BMA House, or having a go on a skatepark and shocking mums and their buggies as they walk by. I love that more and more people want to help with accessibility issues, take on transport companies and make life easier for wheelchair users, whether or not they themselves have a disability. I love that my upper body is stronger than ever, and that my shoulders are broad. I love that heads turn when I pull into a Blue Badge space in my hugely impractical 26 year old convertible, and jaws drop when I somehow manage to unpack an entire wheelchair from the passenger seat. I love that good friends have apparently learnt more about how to interact with people in wheelchairs through knowing me, and know never to push me without asking me first (but are always willing to point out that they are happy to if I need it). I love that I now have freedom to get out of the house, and travel distances further than the short periods I could walk for would allow. I love that I have had to become more confident, to handle the occasions when I throw myself on the ground by accident, or inadvertently crash into people. I love that I am able to continue in a career I love (most of the time! ), because my chair means I can leave the house. I love that I have met incredible people with a huge range of disabilities, who have both taught and inspired me so much. I love that I have learnt to campaign, and now can speak publicly at events to hopefully improve things for the next generation. I love that I am able to use my experiences to advocate for some of the most vulnerable people in our society. Most of all, I love that when I was at my lowest, when I was at my most broken, when my life and career plans seemed to be falling apart around me thanks to a body I couldn’t control, people near and far came together, regardless of whether they knew me, and crowdfunded my amazing chair. I love that in 24 hours I went from desperately trying to pull together every penny to fully funded by incredible friends, some of who I have never even met. I love that my faith in humanity, and myself, was restored by such generosity that I get emotional thinking about it even a year on. Being in a wheelchair, even part time, is hard. A lot of the time, it is miserable, frustrating, and means I spend hours fighting for rights and access others take for granted. But having a wheelchair has changed my life, and today, I celebrate that change. Tomorrow, I return to the fight.